I stood at the Bagatelle stall, flicking a Mootix ball between my claws. The Lupe was grinning wryly at me, a strange glint in his eyes. I continued to flick the Mootix, each descent making the petpetpet shiver more in the muggy heat of the fairground. My own eyes darted to the distorted reflection shown upon the axe in the weaponry store; another distraction to give me more time to weigh up my chances on this obviously rigged game of chance. The vague outline of a Lupe looked back at me, strong and sleek, well groomed but still an ounce of youthfulness giving his eye a certain spark. Harker, as he had introduced himself at first, coughed almost politely, although the Kikoughela he appeared to be suffering from detracting from the overall effect. “Young sir?” he wheezed, as he thumped his chest to clear the unseasonal coughing fit. I turned at the sound of his voice and caught that hauntingly familiar glint in his eye. “Yes, I do think I will try my chances, thank you.” I rummaged in the coin purse attached to my belt and handed over 250 golden Neopoints. The Mootix ball was held still in my claws as I stepped towards the board, its shaking now subdued as it realised it was about to be released into its peg pierced prison. My paw hovered over the top of the board for only a second as I dropped the petpetpet on its unbidden route. With each minute squeak it moved down and, inevitably, fell to the far right. “We have a loser, ladies and gentleman,” Harker heaved, a crackling growl that may have once been a laugh escaping from his jaws. A shrug on my part jingled yet more Neopoints suspended from my belt and for a moment I stopped, contemplating what harm another flutter could do. Before I realised what was happening, my hand was halfway to my coin purse and it was only with strong willpower that I pulled it back, instead turning to movement into a handshake to the grinning stall holder. “That is the curse of dealing in the games of the Lady, Harker. You’re not always guaranteed a win!” I said, a faux smile plastered over my face. He shook my paw smartly, once, then twice, before releasing it and picking the Mootix up yet again from its short lived rest at the bottom of the Bagatelle board. I stepped away quickly, moving across the Deserted Fairground towards another, obviously rigged, game of chance. I thought about why I had come to this place, through the infamous Haunted Woods; it appealed to my sense of adventure, I thought. It was that primal desire running through my veins to explore, to discover, to hunt and to win. As I parted ways with yet more of my hard earned Neopoints at the various stalls, I realised that this wasn’t entirely what drew me to the Fairground. I’d heard about these stalls, rigged so badly not even a blind Korbat could be fooled. Yet I wanted to try my chances, to ask Luck herself for a hand in beating those who made a profit, and a living, from that desire to try just once more. Some hours were spent perusing the various stalls, games and products on offer in that place, and it was in the early hours of the morning that I walked back through the ominous gate that led to the Haunted Woods. I turned once more, my coin purse significantly lighter than before, to look at the nightmare inducing panorama before me. For those who worked there, the night was young and there was money still to be made, mostly from young Neopets like me still milling around the stalls. The only one to have little interest was the Bagatelle, who was cradling something in his paws and peering into a box, some soundless words leaving his mouth. I turned smartly on my heel, curiosity having killed the Kougra but only partially scratched the Lupe. As I moved closed, I heard Harker muttering under his breath. The noise of the Fairground, although muted in the humidity of the woods, was loud enough to cover all but the loudest of steps, and as I walked towards him, the stall holder seemed to barely notice me. “Why do Mootix always insist upon failing me at the worst possible moment? It’s not even as if they’re cheap to replace. I can’t afford any more on my salary!” he grumbled, his sentences punctuated by the occasional cough of untreated Kikoughela. It was only as I stood a mere few feet away that I, in a reversal of roles, coughed politely to get his attention. The wretched Lupe jumped at the sound and turned sharply, if a bit unsteadily, to face me. “Good evening, young sir. I would ask if you’re here to try your luck on the Bagatelle board, but my Mootix have decided to come down with a bad case of skive-a-litus.” He gestured wildly, the single Mootix ball in his hand looking fearful for being tossed under the mallet of the resident Mynci. “Do you not have one to spare? I really do fancy my chances again. Stealing the prize by the tip of my claws and such,” I said, my paw straying to my coin purse slowly but resolutely. “Then why don’t I pay twice the price to equal the poor creature out,” I insisted, taking 500 golden coins from my coin purse and offering them to the stall holder in my palm, “It’ll be just one last game to call it a night, and what Neopet can resist the thrill of one final game of chance?” The Lupe eyed the coins in my paw, the reflection in his ever widening pupils causing him to look like he had golden disks for eyes. “Just the one then, young sir. These Mootix aren’t cheap, after all, and I don’t want to damage this one beyond repair.” He handed me the petpetpet a little roughly to say he didn’t want it damaged and I held it between the tips of my claws. With a quick whisper to whatever forces overlooked the Fairground, I dropped the Mootix ball and watched as it bounced from pin to pin on the board. I closed my eyes hurriedly, not wanting to see what I had just wasted my last few Neopoints on, when a sharp intake of breath following by a coughing fit made me look again. The Mootix had dropped on number 13 of the board, a dark silver star. A grin spread across my face, as I had truly stolen the prize right from the hands of the Lady herself. Picking the Mootix up from its cradle in the slot, I placed it on my palm and offered it to the stall holder. “Here is your Mootix, undamaged although slightly worse for wear,” I said, jest haunting my tone of voice, “I trust that the prize I’ve won was worth my last 500 Neopoints?” Harker hesitated. “Well you see, young sir, there’s the problem of a slight claiming fee on all prizes. Only 100 Neopoints, but if you don’t have the coins, then it could create a...” the Lupe paused as he looked up from shuffling his worn down shoes. I caught his eye and he quickly cleared his threat, which was for once not blocked with the illness he was seemingly plagued with. “Would the cost of the prize not be able to reimburse you slightly for this, ah, claiming fee?” I questioned, starting to feel on edge. Not only were the games rigged, once you did overcome the extremely unfair odds against you, you didn’t appear to be able to claim your prize. A growl escaped from the depths of my stomach before I could stop myself, pure instinct over ruling democratic thoughts in my head. The retort silenced the Lupe into a moment of blankness, his face exhibiting no emotions I could detect, although I did wonder if the dirt hid most of them. Slowly and almost subtlety, a mirthless smile crossed his face like a cloud shape turning into a Meowclops. Another cackling cough made the fur on the back of my neck stand up as the Lupe threw the Mootix ball he was holding into the box that obviously contained the rest of its colleagues. He reached down and lifted the corner of the ragged fabric that covered the wooden planking behind the Bagatelle board, then stepped back up quickly, an old cardboard box held in his paws. After his dizzy spell cleared, he handed the box to me with a dramatic flourish. “I think you’d like me to play a fanfare as I give you this. Not going to happen,” he wheezed. “Really? Not even a drum roll?” I replied, the youthful cheek sneaking into my voice again as I took the box from his paws. One final scratch from his claws on the slightly soggy contained showed the reluctance he still felt about handing over my prize. “No need to be smart with me, young sir. Now off you go. I have Mootix to clean and a Bagatelle board to feed,” Harker said as he turned back to his boxes, an air of busyness now surrounding him. Not entirely sure whether he really was now occupied, or merely procrastinating to avoid answering any of my questions that had started to form on the tip of my tongue, I turned towards the gate once again and strode off, a new spring in my step. My mood, feet and, unfortunately, my coin purse were all lighter from the prize now weighing down my paws in its soggy cardboard box. I wandered through the Haunted Woods, my mind preoccupied on the item in my arms. For all I cared it could’ve been a Pet Rock; it was what it represented that made me so overjoyed at: walking away from the Fairground with something to show for my trouble. Most came back with nothing; a few didn’t come back at all. I had come back with something, and anything is always better than nothing. Although it was not the safest of ideas to walk through the woods without having any awareness of what was happening around me, I came to no harm as I made my lengthy trip back to my humble Neohome in the suburbs of Neopia Central. It was almost daybreak as I arrived at my front door, the Blumaroo gnome on my front lawn looking both ominous and welcoming at the same time. Rummaging for my keys in my pocket, I unlocked the door with one paw, the now slightly drier cardboard box balanced in the other. Although no lights were on as I stepped into my hallway, the familiar layout meant I deposited my reward on the coffee table in the middle of the entrance room with no hassle, except a light pause to swipe away from junk flyers the local mall had pushed through my letter box the morning before. I tapped the box smartly on its top twice, an informal gesture to wish it good night, or as I thought as yet more sunlight started to stream in through my windows, good morning, and I walked off down the hall to my bedroom. Collapsing onto the bed, the weariness I had been putting off throughout the night hit me and I fell into a light, dreamless sleep as the adrenaline of gambling left my body. My last thought was of the old Lupe, coughing, wheezing and very reluctantly handing me the box. The box I had yet to open, which was sitting on my entrance room table, having usurped the junk mail from its place on the varnish. It was only shortly after that I woke up, the sun having barely risen more than four claws from the horizon, but my internal body clock commanded me to wake up as clearly as my stomach told me to eat because it was hungry. Although not entirely refreshed from the previous night’s escapade, I felt better for the little rest I had had and rose from my bed to wash and change for the new day ahead of me. All thoughts of the box, still sitting on my hallway table, were forgotten as I brushed my teeth and changed into one of my favourite shirts and some trousers. As I walked into the hallway on my way to the kitchen, a sudden craving for Neoflakes guiding my feet, I noticed the box again. It was still where I had placed it last night, now almost completely bone dry, its makeshift lid kept closed due to the intertwined cardboard pieces. I lifted it one handed, its lightness catching me off balance, and took it through to the kitchen with me. As I filled a bowl with cereal and milk, I looked at the package. It was plain, unassuming. Not something you’d except a prize to be delivered it. I continued to look at it over my breakfast, stopping my rhythmic chewing occasionally to lean my head to one side in moments of bewilderment. I still didn’t know what it was. I didn’t know if I wanted to know what it was. The stall holder had been very reluctant to give it up, and quite foreboding in his explanation. If it was something utterly random, like an umbrella, I would be happy. If it were something else, something more macabre, I’m sure I wouldn’t like to know. “Or would I?” With that I stepped up from the table, pushing my mostly consumed cereal away. I stalked around to the opposite side of the room, where I had placed the box on a counter top. With a deep inhalation, I tore open the box with one of my claws and peered in cautiously. Expecting something to leap out of the dark recesses, I was quite taken aback when I saw the glitter of tarnished metal and aged wood. I was even more shocked when I realised that in this box was one of the rare paintbrushes that I’d heard about; and it was mine, won fairly from the Deserted Fairground! I placed the paintbrush back into the box gently and lifted it in both paws, holding it steadily as I made my way to the front door. 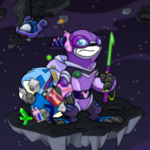 I was going to the Rainbow Pool right away; it wasn’t often I saw specially painted Neopets, and now I’d see one every time I looked into the mirror! A brisk walk later, with even more spring in my step despite the fatigue from the night before, I arrived at the Rainbow Pool. Behind the signs that showed all the colours of the Neopets, all over the world, was the entrance to the actual Rainbow Pool, the place where I could use the paintbrush and become one of the admired Neopets. I quietly excused myself as I walked past all those looking at the boards detailing the colours and up to the counter that blocked the door to the pool. The Acara behind the barrier looked up at me from where he was resting his chin on his paw. “Mornin’, sir. Got yourself a paintbrush?” he asked, half heartedly. “For the purposes of cataloguing each individual paintbrush and what Neopets look like after using the brush, you’ll have to sign here, here, here and have your picture taken there, there and the paintbrush’s picture taken there.” I quickly signed the forms, my paw shaking as I held the pen and signed my name. A security guard, a burly Skeith wearing the expression of someone who really didn’t want to be somewhere, walked out of the door carrying a camera. “This way, sir,” he grumbled, gesturing through the door. I reached into the box and removed the paintbrush, placing the cardboard container down on the floor. “Do you mind getting rid of that for me, please?” I asked the Acara. “Yeah, whatever. Hope you enjoy your new paint work.” I was pushed slightly through the door by the Skeith and led to a plain background set up in the middle of the fenced off area. In the centre was the Rainbow Pool, its colours shimmering and changing in the growing sunlight. My eyes could barely look away as the security guard took pictures of me for the records, along with some of my paintbrush. It was only when his words snapped me out of my daze did I realise he was done. “You can go to the Pool now. Just paint yourself a bit, the Pool will cover the rest of the bits you miss.” he growled, turning to a photo album to put in the photos he had just taken, blowing on the photo paper slightly to hasten the drying process, “Just come back after you’re done so I can take some more pictures.” I gripped the paintbrush harder and ran towards the deserted pool, stepping into the delightfully cool waters. My claws almost cutting the wooden handle in half from the tension, I started to paint my legs. Although barely noticeable at first, my blue tinted fur started to turn a dark gold before becoming a rich brown colour. I rushed to paint the rest of me, and when all the paint had left the paintbrush, I dived under the water. Bursting up through the surface, I startled some Weewoos roosting in the Money Tree nearby and jumped out of the water, practically bounding back to the security guard as the paint dried and bonded to my fur. “Nice colour. Now just hold still while I take these pictures and you can go,” he said, a hint of admiration in his voice. The next few hours went by in a blur. I left the Rainbow Pool, passing the horde of Neopets studying the signs outside, to a mixed response of gasps and wide eyes. With renewed vigour I visited the bank, removed a hefty chunk of my savings and went shopping, getting new clothes that showed off my new, silky brown coloured fur, bright yellow eyes and golden mane that went from my ears to the nape of my neck. I returned home just before sunset, my arms heavy with bags, my stomach full of the rich food served at Kelp, where I had celebrated in style with a slap up meal, and my head swimming with the new self confidence a paintbrush gives all Neopets. I silently thanked Harker, and Lady Luck, along with the poor little Mootix that landed on lucky number 13. Dropping the bags by the same table I had placed the paintbrush on the night before, I collapsed in joyous exhaustion on my sofa. Leaning back, I looked up to the ceiling, the window out of the corner of my eye framing the sun as it dropped slowly down behind the horizon. Life didn’t get much better than this. At that moment, just as the sun shone its last rays of sunlight over Neopia, a pain ripped through my stomach. I doubled up, dropping to the floor, my skin screaming red hot under my newly painted fur. I started to rip at my new clothes, the burning sensation getting worse as new, stronger and larger muscles erupted all over my body; the toothache of 20 years was combined into one second as huge fangs grew from my normal teeth. Looking up into a mirror, I saw my fur get longer, matted, dirty and grubby. I stood up uneasily, pain still pulsing through my body, and it slowly subsided until it lingered just on the edge of the consciousness. As I looked at myself, I realised what had happened. The brush, oh that once wonderful brush, was one of the cursed items. I had become a Werelupe, once found all over Neopia, both in nightmare and in the flesh, before they were driven to the Haunted Woods as punishment for their stomach-churning crimes. I stared into the mirror, into what were only hours before beautifully yellow eyes, and saw looking back at me the dull, grimy gold of a monster. Out of sorrow, maybe instinct, I raised my head to the circular shape of Kreludor in the sky and howled. The sound drifted out over the Neopia Central plains, its chill reaching into every home and making people wake from their dreams in a fit of cold sweat, fear gripping their bodies. And then I ran. I ran out of my beloved house, out of the suburbs, back to the woods where I had been cursed by a game of chance in a Deserted Fairground. As I ran, the instinct of the Werelupe started to overrule what remained of my mind. With the last inch of Neopet consciousness I had, I thought; yes. Sometimes you can grab the prize from the hands of Lady Luck herself. But sometimes, just sometimes, it’s better to let her keep it. Luck? Chance? Ten tons of pressurized gas?